Nestled in the heart of central Florida, the gorgeous 82-room Hampton Inn & Suites Lady Lake-The Villages, FL hotel offers beautifully appointed accommodations at a real value. We are located near the corner of CR-466 and Buena Vista Blvd. In The Villages, our Hampton Inn & Suites hotel overlooks graceful horse farms and scenic golf course communities. Relax in our comfortable Carriage House-style lobby, near the fireplace of our Hampton Inn hotel. Visit points of interest nearby our hotel in the Lady Lake, Florida area, such as the spectacular interconnected Chain of Lakes, Harbor Hills Golf and Country Club, The Villages Polo Fields, Austin Carriage Museum or Del Webb's Spruce Creek. Take in a show at the Savannah Center near Hampton Inn & Suites Lady Lake-The Villages hotel of Lady Lake, Florida or stroll through Lake Sumter Landing's Market Square and Main Street's Town Square for truly unique shopping, dining, movies and nightly special events. Just 90 miles north of Tampa and 65 miles from Orlando International Airport, Disney, Sea World, and Universal Studios, you can also take part in local activities near our Hampton Inn & Suites Lady Lake-The Villages hotel of Lady Lake, Florida. Some nearby attractions you'll enjoy include golf, polo, bowling, tennis, pickleball, softball, paintball, horseback riding, boating, fishing... you name it Planning a meeting or special event in the Lady Lake, Florida area? 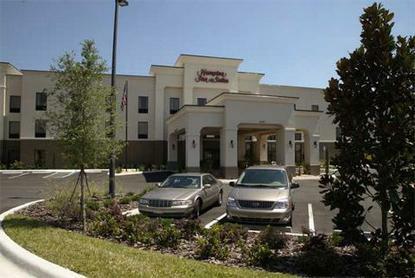 Let our Hampton Inn & Suites Lady Lake-The Villages hotel of Lady Lake, Florida make it easy for you. Our meeting rooms can seat up to 50, and we have a variety of audio-visual, catering and decorating resources available at our hotel. Choose between elegant king or double queen hotel guest rooms, or spacious studio suites. Amenities at Hampton Inn & Suites Lady Lake-The Villages hotel of Florida include complimentary hot breakfast served daily, high-speed internet, voicemail, local calls, USA Today, fresh-baked cookies in the evening, an exercise room and sparkling outdoor hotel pool. Contact our cordial front desk agents about our convenient business services at Hampton Inn & Suites Lady Lake-The Villages hotel of Lady Lake, Florida. Studios feature sofas, mini-refrigerators, microwaves and wet bars. We love having you here at the Hampton Inn & Suites Lady Lake-The Villages, FL hotel in Florida.